Following the sudden and amazing display of nature’s power that was the 1980 eruption of Mount St. Helens in the Pacific Northwest, something unexpected and beautiful was discovered. A brilliant creation was produced from the heated volcanic rock dust. Named “helenite” after the mountain from which it was born, most of the helenite still available is a gorgeous green. So when we found a small amount of helenite in smoldering, deep red we knew we had to secure some for our discerning clients. 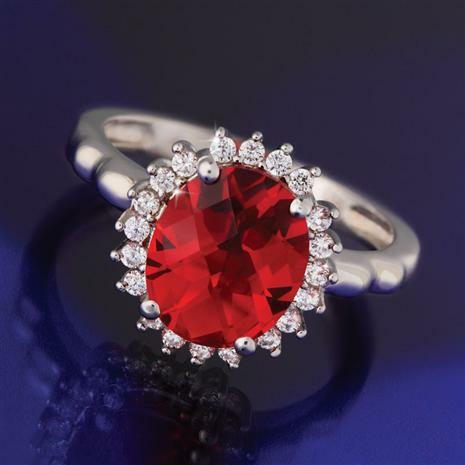 This uniquely American gem is a beautiful way to heat up your great American love story. The fiery stones are absolutely ablaze with light. Each 2 carat, oval-cut helenite stone is dramatically prong-set and surrounded by the white flash of lab-created DiamondAura® rounds. Mount St. Helens erupted only once, and red helenite is pretty hard to come by. Don't miss this chance to own a rare, fiery beauty at a price that’s just as hot.